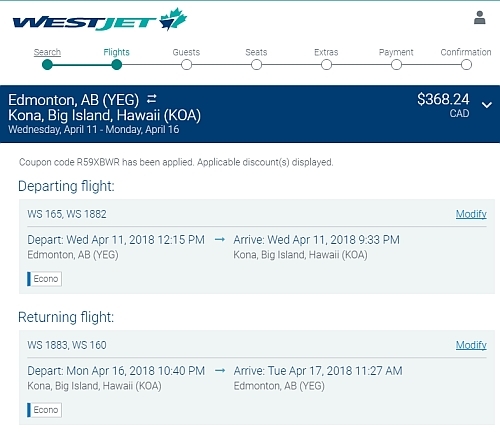 WestJet is showing flights from Edmonton to Kona, Hawaii for $368 CAD roundtrip including taxes. However, they are only showing single seats (1 seat on each flight) for the cheap price. You may also be able to find some cheap ones to Honolulu (HNL), Maui (OGG), or Kauai (LIH) in April - but from what I've seen, only single seats are available for roundtrip flights. But, if you are interested in booking an open-jaw flight (flying into one city in Hawaii, and home from another) you may be able to find cheap multiple seats in both directions (see below). If you are interested in booking an open-jaw flight (flying into one city in Hawaii, and home from another) you may be able to find multiple cheap seats in both directions. Focus on April dates. WestJet has generally been offering cheap prices on multiple seats in one direction, but not from the other. So if you are interested in an open jaw flight, you may be able to fly into Kona, and home from Honolulu, and find multiple cheap seats in both directions. This can be a little tricky as you may need to try a few searches to look for cheap flights to each city, and look for the dates that have multiple seats. Search for a flight into one Hawaiian city, and home from the other. The following screenshot is for *TWO* passengers, flying into Kona and home from Honolulu, for a grand total of $770 ($385 per person). NOTE: This still leaves you with needing a one way flight from one Hawaiian island to the other. It's not very cheap to fly between the Hawaiian islands. The flights generally cost around $200, one way, for a relatively short flight. 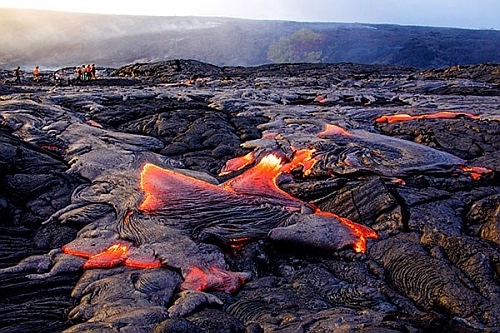 edmonton, yeg, westjet, flight deals, united states, hawaii, north america, kona and koa.